A+ Travels to Chattanooga for the First Ever Scenic City Junior Silver Tournament! A 5 AM departure time didn't stop us (pictured left bright and early)! 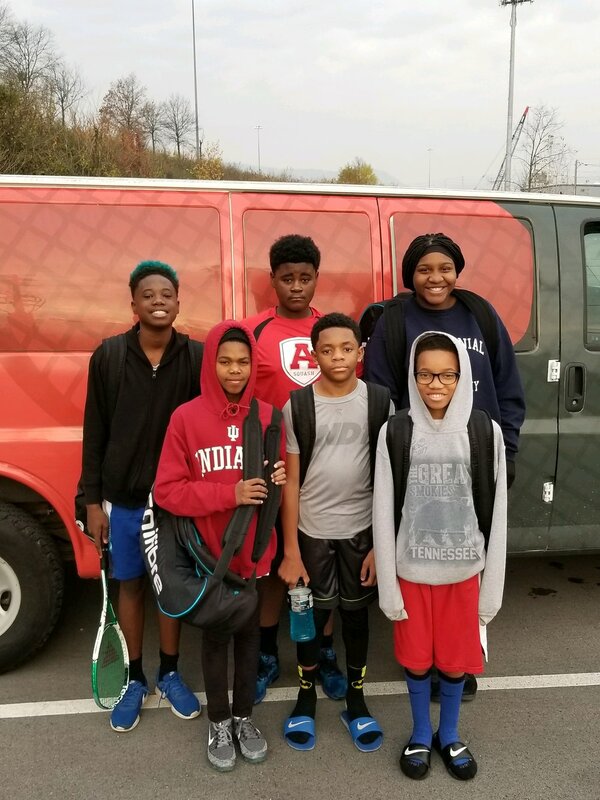 Six of our senior players traveled to Chattanooga, Tennessee to compete in the first ever Junior Silver Tournament hosted by Scenic City Squash! It was an exciting day for our players, not only to compete, but to also build camaraderie among teammates and make new bonds with other players and members of the Southeastern Squash community. Three of our A+ players won their matches, and Kennedie Jackson took home 3rd place in the girls division! Congratulations to all of the players who competed! Thank you to all who made this event possible. A+ Squash is dedicated to promoting community involvement through volunteering. 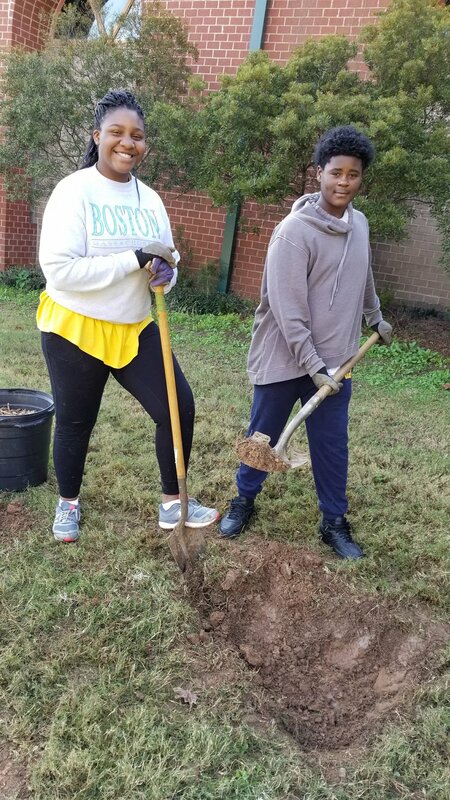 For our A+ Squash Volunteer Day students worked with Trees Atlanta planting trees at the Rosel Fann Rec Center. 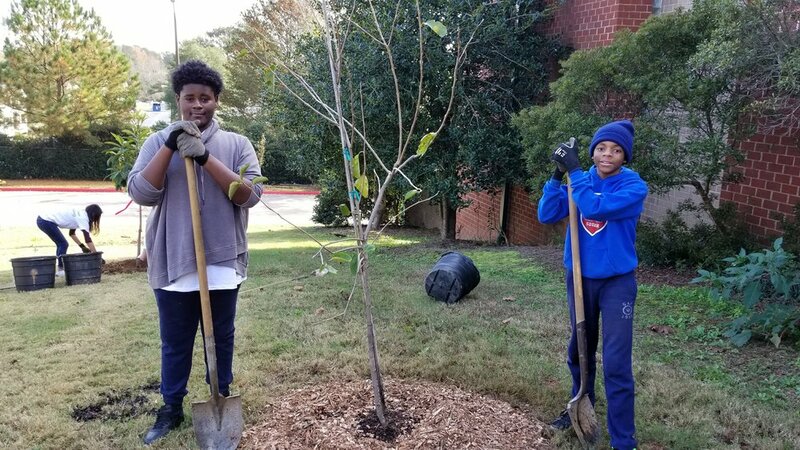 This organization works tirelessly to address Atlanta's tree loss and protect the urban forest while promoting conservation and educating on the importance of green spaces. 13 A+ students, 2 staffers and 5 family members planted over 10 trees! Well done Team! A+! Nick Matthew, is one of the greatest squash players of all time, having achieved all of the sport’s major honors three times apiece and been ranked World No.1. Renowned for his extraordinary athleticism, strength and fitness, A+ Squash was lucky enough to watch "The Wolf" compete in real life and see some of the best squash in the world. A+ Squash players were stunned at the level of play and motivated to get back on court and train even harder. What an A+wesome opportunity for our young players! Thank you to Andre and SESRA for sharing the experience with us! "It was a pleasure to meet the A+ players while I was in Atlanta. They have a ton of potential and clearly love squash. I am looking forward to following their progress"
Camilla "Millie" Tomlinson, hails from England as the No. 22 ranked squash player in the world. In 2017, Tomlinson finished runner-up to Nele Gilis in the final of the Irish Open and broke into the world’s top 30 for the first time in the May 2017 World Rankings. With 12 PSA Titles to date, A+ Squash was honored to have Millie instruct our athletes as she focused on building technique and the basics of what makes a competitive squash player. "I really enjoyed playing with the A+ Squash team, thank you for having me! I was impressed by their work ethic and attitude throughout the session. It was a lot of fun to hit with people who clearly love the game so much!" Seeing a drone soaring hundreds of feet into the sky, among the birds and trees is always a thrill. But, what mechanics allow it to fly, and what tools do you need to build your own? 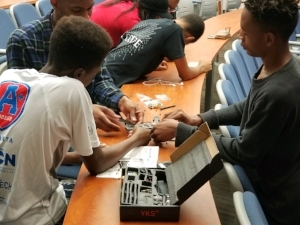 Those are the questions the A+Scholars answered as they attended, "How To Build A Drone" workshop with the National Society of Black Engineers. A+Squash spent the day assembling dozens of pieces to learn the components of what makes flight in drones possible. It was an exciting opportunity for our scholars to get involved and learn more about careers in engineering related fields. Thank you to the National Society of Black Engineers for inviting A+Squash to be apart of the program! 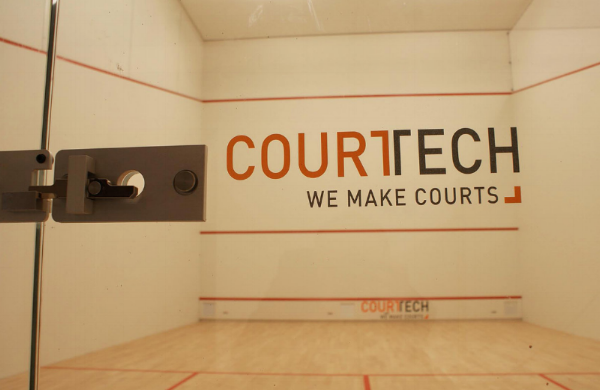 A+ Squash is excited to announce a new partnership with Atlanta-based squash court builder CourtTech USA. This relationship is poised to be an exciting venture that will help to expand the squash game in the city, making it more accessible to all and an incredible boost for Squash in the Southeast. CourtTech USA is the #1 squash court builder in the country. With projects ranging from coast to coast and 40+ courts being built each year, CourtTech is achieving their goal of bringing squash to all one build at a time. The company’s team is comparatively young and full of passion for making squash accessible to all generations and socioeconomic groups. For this reason, when CourtTech found out about Atlanta’s own urban squash program, they immediately reached out. A+ Squash Executive Director, Telvin Debnam, eagerly welcomed the opportunity to collaborate with CourtTech. Armed with the passion for change and the knowledge that squash is scarce in the Southeast, the two organizations are hopeful for what this first-of-its-kind partnership will bring. 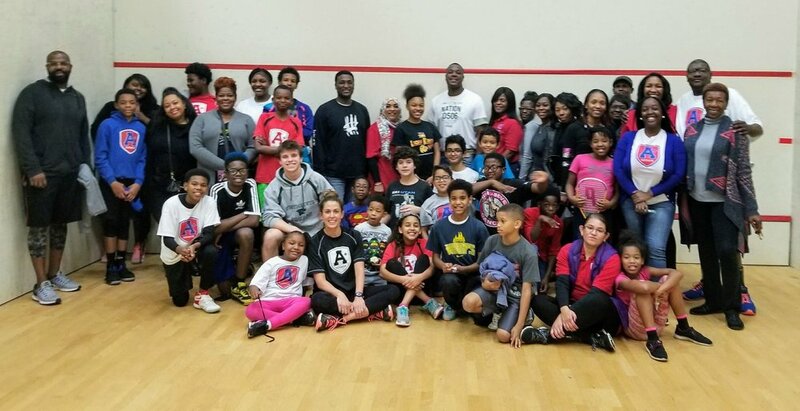 Where A+ brings the platform, opportunity, and community Atlanta needs to embrace the squash game, CourtTech brings the experience in expanding the sport and the enthusiasm in sharing their connections and expertise. Atlanta can officially keep its eyes open for squash to become a popular sport in the city, as well as an outlet for our city’s youth. Future goals for this partnership include hosting more events for A+ Squash to show off their talented students, team up in contributing to community service projects, and bringing more squash courts to Atlanta. For more information on CourtTech USA, go to: http://www.courttechusa.com. In February, A+Squash participated in the Piedmont Driving Club Silver Tournament, with a team of 13 players competing. "Our players are steadily rising to the occasion and this tournament was proof of how far our squash team has come throughout the years. 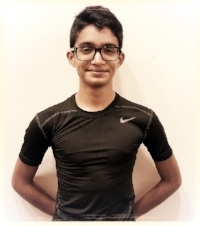 Students have put in tremendous effort to advance in squash, and they are now comfortable competing with many players who train and take professional lessons regularly. Our team had an impressive run and we had numerous players finish in the Top 8 of their divisions. We are one step closer to picking up our first tournament win."